I get asked often if I still love the iPad. My answer to the question is YES and continuing to grow everyday! There are so many new and amazing things being developed for the iPad relating to special needs and communication every day! I have been using Tapspeak Sequence with Makenzie since this summer and find new uses for it every day! This app allows you to program sequences into the iPad that are customized specifically to your child. You can record your voice or anything that makes sound into the app along with importing pictures, using the preloaded symbols or Board Maker images (sold separately) in the customization process. It also is Tap configurable to accommodate kids with varying motor skill levels. For Makenzie we have made a lot of learning activities. We have imported images of letters and picture cards and made sequences that spell her name and recite names and sounds of the alphabet. I have read books into the app which has allowed her to participate in reading the book while I turn the pages. The Tapspeak Sequence app is easy to use. The ease of use makes it easy to make more learning and communication aspects of everyday life available to Makenzie. Since I have been homeschooling Makenzie I have been able to read through the lesson plan and add different things like patterns, colors, numbers, beginning, middle, end, and phonics, quickly into the app for specific use during that days lesson. I am in love! In the time I have spent using this app I have realized that not only is Tapspeak Sequence a wonderful tool for children/adults with special needs but for all children. My boys have used this app as well as vocabulary study cards for a test and math facts. Did I already tell you I am in love! Point being.... if you have a child of any ability and a little bit of creativity this app is for you! Here is a video review I made explaining what Tapspeak is and how to use this app. The developer of Tapspeak Sequence has also developed another app called Tapspeak Button. This app works just like a Big Mac switch which says one phrase at a time. This could be good for phrases like "juice please", "That's the one I want", and "All done". Makenzie has used this app as well. Her favorite thing to say is "NO"!! LOL! There is nothing like giving a child their voice! Now for the most amazing development so far... in my opinion...is the soon to be released by Tapspeak, Tapspeak Choice. This app will be portable, innovative, and socially acceptable communication device all built into your iPad. Wait.... I am not done.... it will also have "Direct access and many scanning modes including two-switch scanning built into the software. You will be able to use the entire iPad screen as a switch or RJ Cooper’s new Bluetooth external switches and accessories." Or in plain English... you will be able to use either the screen or a switch to activate Tapspeak Choice. Now that is AMAZING! To check it out for yourself click here! This app should be released some time this month! Well one of you are in luck because Tapspeak has given Makenzie a set of the Tapspeak Sequence and the Tapspeak Button apps to give away to one of her readers! 1. Post Makenzie's Miracle button on your blog. 2. 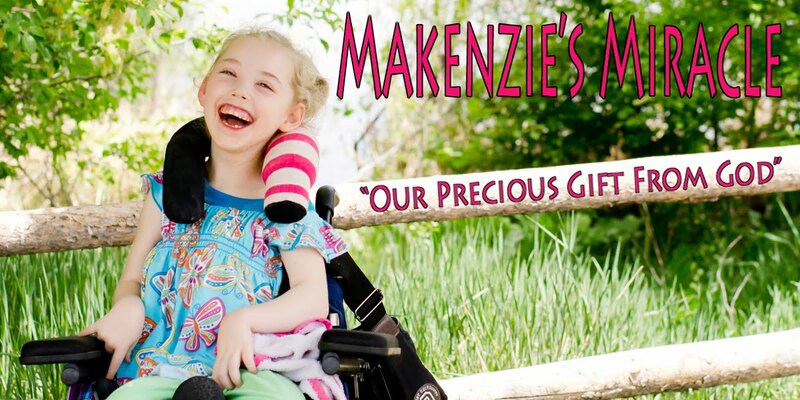 Follow Makenzie's Miracle on here or on Twitter. 3. Visit the Tapspeak website and share how you would use the app. 6.Post a link to this giveaway in a blog post, or in a tweet and leave the link here. I have added your button to my blog Mackenzie. Makenzie I visited the tapspeak website and this app is awesome. I can't wait to try it with Joey. I found you on Facebook and I'm now a fan. hi! I am so excited to share with you my first english book as an app on Ipad. My publisher has launched severall interactive books that should be fun! I've been looking at the TapSpeak apps. If I had one I'd show them how to use it at David's preschool. I know they use a big mac button with him sometimes. It looks like they'd be able to save lots of phrases he could use throughout the morning, making it an even easier tool to use. At home I think we'd use it at the table as an alternative to signing "more".